Grail's story is told, from birth to her first kill, to earliest days. Grail has nightmares plagued with the image of Darkseid, so much that she attacks her own mother, Myrina Black. Grail kills any who come close to her mother, leaving the two them to each other's company. They begin to plan to kill Darkseid, but that plan enlarges to include Mobius and the Amazons. Steve Trevor is imbued infernal energy in order to exact the plan and ripe with her appeared success, Grail moves to bring about the last phase of her scheme. Story - 3: While primarily an origin story for Grail, Johns tries to balance the aforesaid with sub-events involving Power Ring, and Cyborg... and he shouldn't have. Grail's story is interesting enough, that readers would be interested in seeing more development about her, hence she become the generic evil antagonist that litters too many comics. Myrina Black is the generic Amazon: she kills (men, of course), she fights in wars, she has a sword, but her moments where she is loving to Grail do resonate, albeit for a planck second. It is very hard to understand why the storyline needed an extra issue in the form of this special. There is nothing that occurs, which couldn't be remedied within the confines of Justice League, proper. Myrina Black did not need the space, and the room for Grail, while interesting is too short. 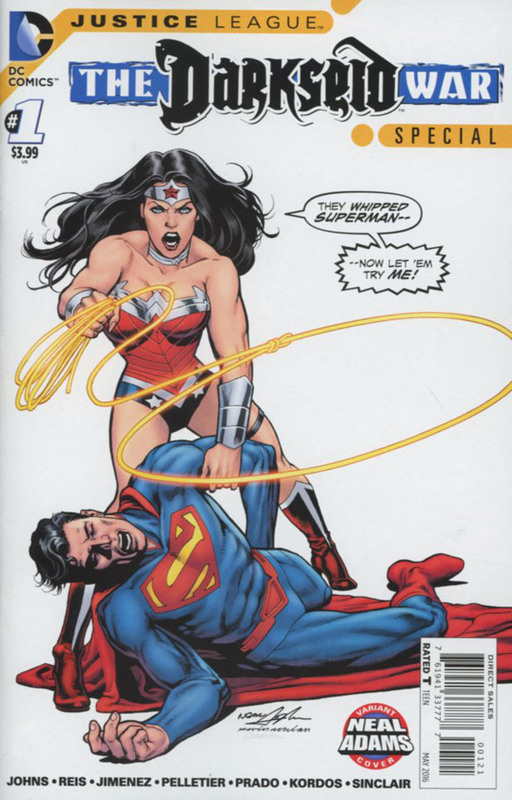 Steve Trevor being captured again, in the day and age where damsels-in-distress are verboten, is humorous for its hypocrisy, but nothing that needed an additional 24 pages to render. Even Grail's plan loses cohesion, as she has accomplished her primary goal, but doesn't seem to realize it, so enthralled by snogging Steve Trevor, she is. It's not a bad installment, just an altogether unnecessary one. Art - 2: Multiple artists can be great or they can make an issue into what we have here, a conglomerate of same pages you'll like and some that you won't. It's unsatisfying either way. 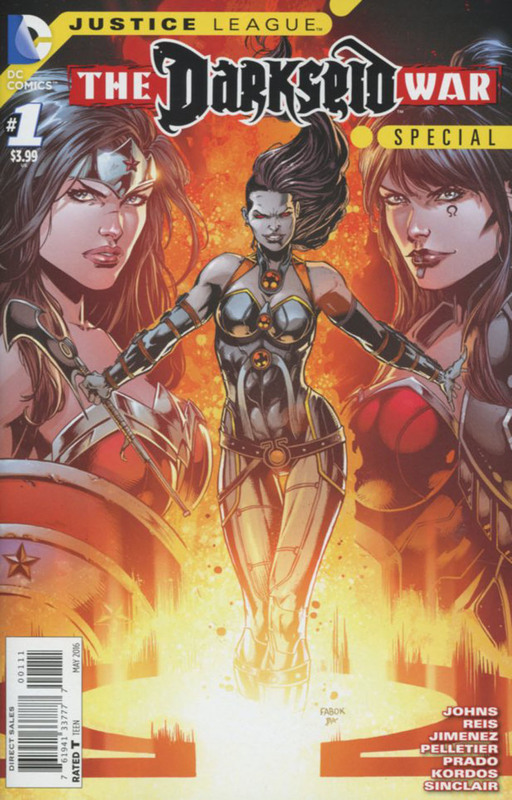 Cover Art - 3: There is no difference between Wonder Woman, Myrina Black, or Grail� They each look like they would kill you at the drop of a head... er, hat.